Reports note that Carl Humberg, a botanist, was the first to identify this Rooibos plant in 1772. Years later, the event surrounding WWII made it difficult to buy and ship tea out of Asia and a Russian immigrant, Benjamin Ginsberg, realized its value and started marketing rooibos as an herbal substitute to tea. The demand for Rooibos grew. Generations had enjoyed Rooibos for the sweet taste it rendered yet remained unaware of the health applications that would soon be reported. It was decades later, with the publication of a book titled "Allergies: An Amazing Discovery," that the popularity of Rooibos skyrocketed. Annique Theron, a South African mother, discovered that the natural healing properties of the Rooibos plant soothed her infant suffering from colic and insomnia. With further research and investigation, Annique documented the amazing health benefits of Rooibos in a book titled, "Allergies: An Amazing Discovery” which was published in 1970. It was the publication of this book that led to Rooibos tea’s worldwide recognition. Today, Dr. Theron’s findings have proved to be beneficial not just to babies, but to all ages. While Rooibos tea may afford consumers health benefits, according to the Tea Association of the US, “the body of research supporting claims for Rooibos is tiny in comparison to the volumes of scientific evidence published about the health benefits of Camellia sinensis”. Never had Rooibos tea? Try the amazing sample set from Rishi Tea. It includes 1 oz. 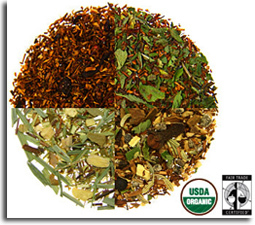 of each of the following, all are Organic and Fair Trade Certified: Blueberry Rooibos, Peppermint Rooibos, Ginger Lime Rooibos, and West Cape Chai. $11.05 at www.rishi-tea.com. The Tony Award®-Winning Comedy Thriller! The 39 Steps, Broadway’s smash-hit comedy thriller based on the beloved Hitchcock film, was honored with not one - not three - but TWO Tony Awards! Now this hilarious hit has moved its handsome heroes, deadly spies, mysterious encounters and mountains of herring to New World Stages! You’ll scream with laughter as t he sensational cast of 4 plays 150 characters in this action-packed theatrical adventure about one man’s quest to clear his name. RESTRICTIONS: Offer valid till 9/5/10. Limit 10 per customer. All prices include $1.50 facility fee. Subject to availability. Additional Blackout dates may apply. 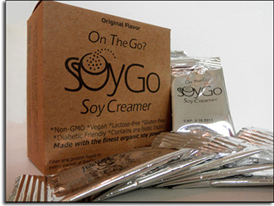 Gluten-free, vegan, non-gmo, all-natural, lactose-free, gluten-free, and diabetic-friendly, SoyGo! is perfect for the health-minded coffee or tea lover on-the-g o! The creamer performs similarly to traditional creamers but offers those with special needs a great and portable alternative. According to published information, it is made with the finest, organically grown soy powder available. As a soy product, it contains both protein and fiber in every serving.